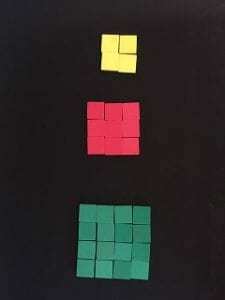 Connect to perimeter and area lessons by noticing the area might be the same, but the perimeter changes. Connect to multiplication commutative property (3 x 4 = 4 x 3). 4. 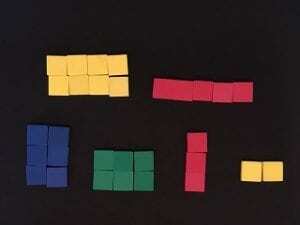 Make a rectangle using 24 tiles. 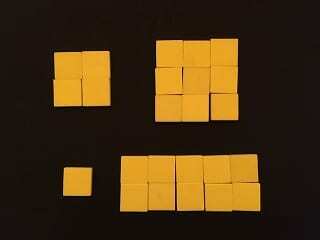 If you decompose it, how many different smaller rectangles or squares can you make? Explore with tiles first, then record results on graph paper. 5. 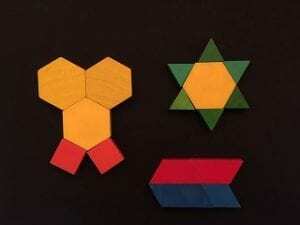 How can you use color tiles to decompose a polygon into smaller rectangular shapes? 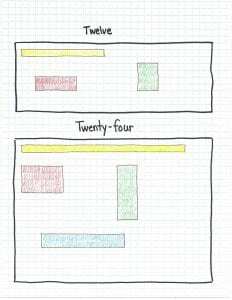 For students to master this skill, they must have a good understanding that opposite sides of rectangles are equal length. This is also crucial for determining area. 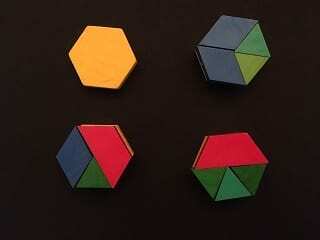 Students at a level 0 would be choosing shapes to combine in any manner. They may or may not match equal edges together. It may or may not make a recognizable design / shape. Students moving into a level 1 are paying attention to the properties of the shapes they are combining. What is a side? What are corners? 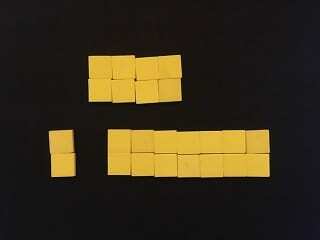 Equal size edges must match together. Students combine shapes that fit exactly into an outline. 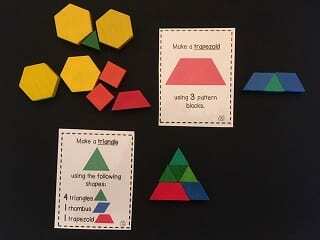 This encompasses composing (because they are using smaller pieces to build a larger shape), but also decomposing if the student shows multiple ways to fill in a shape — 2 trapezoids = 1 hexagon; 3 rhombus = 1 hexagon; 6 triangles = 1 hexagon. 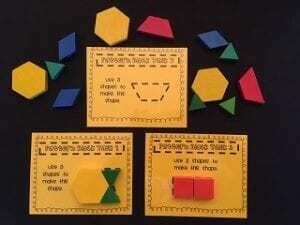 OR, 1 hexagon = 1 trapezoid and 3 triangles; 1 hexagon = 1 trapezoid, 1 rhombus, and 1 triangle, etc. 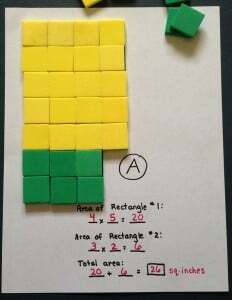 This exploration is also beneficial to understanding equivalent fractions. 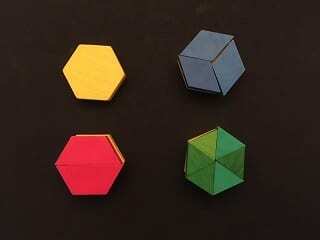 Students at Level 1-2 may create shapes which have more than one property and/or fit into more than one category: symmetrical, a shape using a particular number and type of pattern blocks, those in which shapes must be manipulated (rotate, reflect, slide) to achieve the results, or shapes which substitute blocks (example: 1 triangle and 2 rhombus can make a trapezoid).